Jenja's first dedicated Drum and Bass night in the main room is finally here. 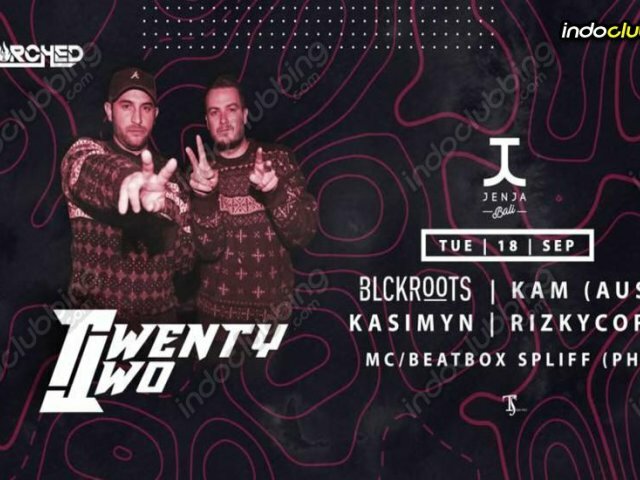 Redlining the FUNKTION ONE sound system on the night are none other than New Zealand's freshest Drum and Bass producers Twenty Two. Twenty Two AKA Kyle Wright and Adam Hynes have been producing music for nearly a decade now. Headling shows through Asia, Australia and the Pacific islands they have toured with some of the worlds finest such as NERO / Matrix & Futurebound / The Prototypes / Fred V & Grafix / Macky Gee / Delta Heavy / Brookes Brothers / Teddy Killerz / Mind Vortex / Danny Byrd / DC Breaks / Dimension / Herobust / Sikdope / KOVEN. / Metrik / Drezo / TREi / TC & plenty more.